A broken collarbone (clavicle) is caused by a fall on the corner of the shoulder or on to an outstretched arm (usually in a cycling accident). Another name for it is a: Clavicle fracture. The clavicle is the bone that connects the shoulder blade (scapula) to the sternum. The clavicle is part of the shoulder girdle. Classification: In many cases the fracture line of a fractured or broken collarbone is located in the middle section or shaft of the clavicle. However, a more lateral or medial fracture is also possible. 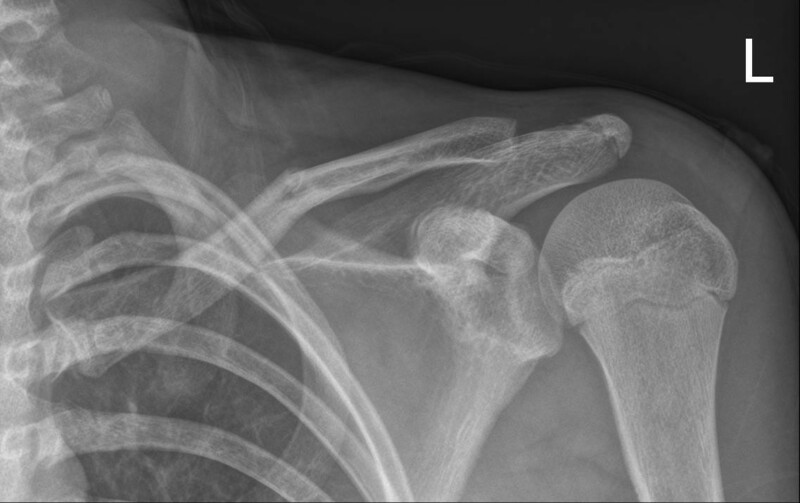 A fractured clavicle is a very common fracture. Pain, which decreases when you support your arm. Very limited movement in the shoulder (partly due to the pain). Often the only indication among children. Swelling or crunching of the collarbone. Because the collarbone is so easy to examine due to its location, after an examination, the doctor can usually establish with certainty whether your collarbone is broken. The doctor will also examine whether there is any injury to the skin, blood vessels and nerves, caused by the (sharp) edges of the fracture. Once the right diagnosis has been made, the doctor will consult with the patient about the most suitable treatment: wearing a sling (conservative treatment), elastic stable intramedullary nailing (ESIN) or plate-and-screw osteosynthesis (PSOS). Treatment for a fractured clavicle may consist of conservative or surgical treatment, in which the choice of treatment is determined by several factors. We can roughly assume that a fractured or broken collarbone will be treated conservatively unless it is accompanied by injuries to the skin, blood vessels or nerves. Visible movement of the bone fragments or cosmetic aspects may also constitute reasons for deciding whether or not to operate. Conservative treatment: Fortunately, it is a bone fracture that almost always heals easily. Complications rarely occur. Treatment is straightforward; a few weeks rest is all that is needed. The fractured collarbone is usually immobilised using an adduction bandage or sling (Figure 8 bandage), painkillers and rest. Among children: generally a greenstick fracture, with intact bone membrane. It always heals. A sling is worn for one to three weeks depending on the pain. It does not need to be worn at night. Once the child no longer experiences any discomfort, or very little, the sling is no longer needed. The function of the shoulder and arm is usually fully restored within a few weeks. It is wise to wait six weeks after the accident before resuming sports and gymnastics. Adults: In general a sling needs to be worn for between three and five weeks. During the last two weeks it does not need to be worn the whole day. The sling can be removed when showering, taking a bath and at night. If the position varies considerably this will normally decrease over the course of the first week. As soon as the pain allows, start with pendulum exercises (be guided by the pain when exercising). After four to six weeks it should be possible to raise the arm well above the head once more. Physiotherapy is rarely needed. After six weeks the fracture should be healed, and most work can be resumed. Heavy, physical labour, in which the shoulder is put under a lot of strain, may have to wait several weeks longer. Complications: After the fracture has healed a thickening of the bone may remain visible at the site of the fracture. The shoulder may also be shortened, because the collarbone has become shorter due to the fracture. This usually has no effect on the function of the shoulder. There is also the possibility that the fracture does not heal. Surgical treatment: There is only an indication (=reason) for an operation in exceptional cases. One reason for operating could be that the piece of bone risks piercing the skin. The decision to operate may also be influenced by economic reasons or concern athletes. A serious deviation of the position in itself is not generally a good enough reason for an operation. The disadvantages of an operation (an unsightly scar, risk of infection) do not outweigh the benefits (corrected position). During the operation the anatomical position of the bone fragments is restored as much as possible and the fracture is fixed with a plate-and-screw osteosynthesis (PSOS), or elastic stable intramedullary nailing (ESIN). Complications: Fortunately most complications arising from the surgical treatment are rather rare. Infection, wound problems, non-healing fracture, the fixation material coming loose with the fracture moving to an unacceptable position are the most common and serious complications. The end result will not only depend on the treatment and rehabilitation, but also the patient’s age, lifestyle (smoking, alcohol consumption), bone strength and general health. These factors will also be considered when deciding whether to operate.